Widespread use and acceptance of the World Wide Web in the home and office has eclipsed many other technological advances. Next-generation applications like wikis, podcasting, streaming video, virtual reference, RSS feeds, and blogs sit on the cutting edge of changes that will—and have already begun to—transform librarianship. Medical Librarian 2.0 is a vital groundbreaking resource for understanding and implementing these technologiesin reference services. Medical Librarian 2.0 is both an examination of current technology and a resource for practical applications as well. This important collection includes informative chapters that cover the evolving spectrum of digital tools. Through detailed explorations of current technologies, as well as the ways institutions have implemented them to better serve both patrons and staff, this text provides the insight and necessary awareness required for librarians who want to stay current with these technologies and to make their services relevant to the newer generation of users. With a wealth of informative tables, diagrams, Web site illustrations, online resources, photographs, and references, Medical Librarian 2.0 is an essential resource that looks at the pervasive Web technologies medical libraries—and other libraries—are successfully adapting to both update old services and provide new ones. • and many other important topics! 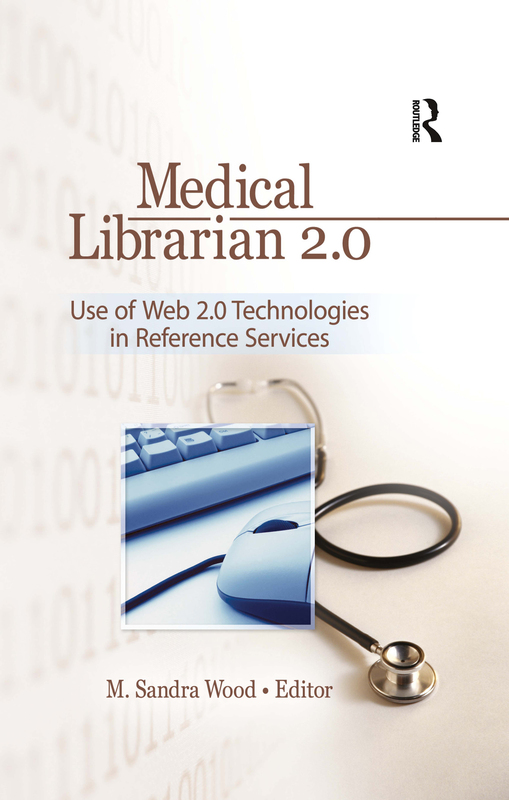 With a wealth of tables, diagrams, Web site illustrations, online resources, photographs, and references, Medical Librarian 2.0 offers readers clear examples of these applications put into practice. Medical Librarian 2.0 is an essential resource for librarians, especially those in medical settings, library science educators and students, and those looking to stay at the forefront of emerging reference technology. M. Sandra Wood is Librarian Emerita, Pennsylvania State University. Her experience and interests are in general reference, management of reference services, database and Internet searching, and user instruction. Ms. Wood is Editor of Medical Reference Services Quarterly and Journal of Consumer Health, and Co-editor of the Journal of Electronic Resources in Medical Libraries. She is author or editor of numerous books, including Health Care Resources on the Internet: A Guide for Librarians and Health Care Consumers. She received the Medical Library Association's Eliot Award, and the Chapter Achievement Award from the Philadelphia Chapter/MLA. Ms. Wood was elected to MLA's Board of Directors (1991–1995), and served as MLA's Treasurer. Ms. Wood has been a Distinguished Member of the Academy of Health Information Professionals since 1990, and a Fellow of the Medical Library Association since 1998. She retired in December 2005 with over 35 years of experience as a medical reference librarian.